Celebrating the life of Edward Jackson, Jr.
Obituary for Edward Jackson, Jr.
Edward Jackson Jr. died peacefully at Mary Washington Hospital on March 6th in Fredericksburg, VA at the age of 65. He was the son of the late Edward Jackson Sr and Doris Jackson. He was affectionally known to everyone as “Eddie”, “Pee Pee”, “Nang.” Eddie enjoyed racing and will be missed by many. 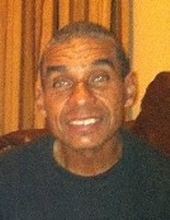 Eddie was blessed with two children: son Ryan Hayes who preceded him in death, daughter Amanda Shelton (Lance); grandchildren: Ryan Oliver, Ryanita Hayes, Ryan Jr., Tristen, Lance, and Mya Shelton; great grandchildren: Rylee, Raheem and Dakota; siblings: Paulette Jackson (Vernon), Oneal Jackson, Donna Kelly all of Westmoreland County, Joyce Gregory of Bowie, Maryland, Tony Jackson of Grand Rapids, Michigan and Robert Jackson whom preceded him in death; aunts: Gladys Richards, Mary Nash, Betty Ann Mitchell (Edward) , Bertie May Jackson, and Thelma White; nieces: Monica Jackson and Verniecha Johnson (Emmanuel) , nephews: Andre and Joseph Gregory, and a host of other relatives and friends. To send flowers or a remembrance gift to the family of Edward Jackson, Jr., please visit our Tribute Store. "Email Address" would like to share the life celebration of Edward Jackson, Jr.. Click on the "link" to go to share a favorite memory or leave a condolence message for the family.